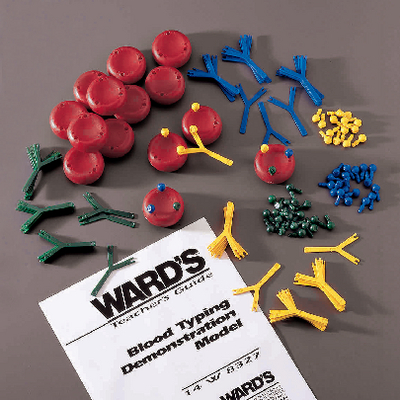 Ward's Blood Typing Model gives students a visual interpretation of a difficult concept. It recreates the antigen-antibody interactions occurring on the surface of red blood cells. Using the model, teachers can demonstrate the antigen-antibody reactions that occur at the molecular level including blood-typing reactions, successful and unsuccessful blood transfusion reactions, and Rh incompatibility. Ordering information: This model includes two erythrocytes and one pair each of A, B, and Rh antigens and antibodies. The Class Size Kit contains six sets of material contained in the demonstration set.